Finally! A big crochet project is underway. It's been too long since I crocheted something. This project was brought to you by the incredibly cheap acrylic that Aldi was selling a few weeks ago. It is not the best feeling stuff around, but I have held off for such a long time I just went a little berserk when I saw all the balls of yarn and threw all the black and white ones into the trolley before common sense returned. I'm making this one for my eldest son. Anyone who has known me for long enough might remember another blanket I made for him, and wonder where that is. I'll tell you where it is, it is hidden in the storeroom where the kids can't touch it because I spent too much money on very nice cotton and I'm terrified of something bad happening to it. Which is all rather silly, so this time I decided the yarn would not be precious! Something else that worried me about the last one was that I'm not altogether sure I finished my ends securely enough. I feel kind of like a bad person saying this! It's all my fault! I admit it! 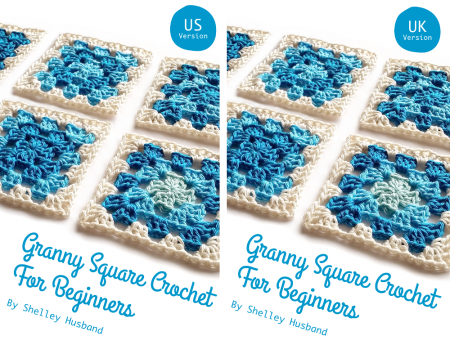 This time I decided to brush up on the basics before tearing into the project, downloading Shelley Husband's great little book Granny Square Crochet for Beginners. Shelley is a mine of useful info if you are learning, trying to remember after a long hiatus, or looking to move beyond the basics. Of course I'm biased because I've known her in the crafty community for years and I am her graphic designer. I had two options in mind, based on two pins on my crochet board on Pinterest, one big granny and the second lots of little grannies. This is as close as I get to following a pattern or making a plan. After reviewing the basics - especially the 'finishing ends' bit, I decided I'd be doing one big granny instead of many little grannies and joining them. I am not feeling patient with this project, I want it done! And I shall finish it with pom poms on the corners. I'm so pleased you're crocheting again. Good call on doing one big granny (insert dirty laugh) It will keep you warm over winter as you work on it. It already covers my knees! The next big decision is when do I stop? How big do I go. I'm not sure yet if it's for his bed, or just a nice big throw that can sort of decorate the bed and be used for snuggling. I've just about finished my first two balls, so I can confidently say I have plenty of yarn to make it as big as I like! Maybe I should halve the yarn stash and plan on making a second one for littlest. More synchronicity! Downloaded Shelley's first e-book (lovely design by the way) ages ago. Then just last night was checking out crochet stuff on Instagram - stumbled across more of her recent work, downloaded her "App" and another of her e-books! She is so prolific! Clever chicky.